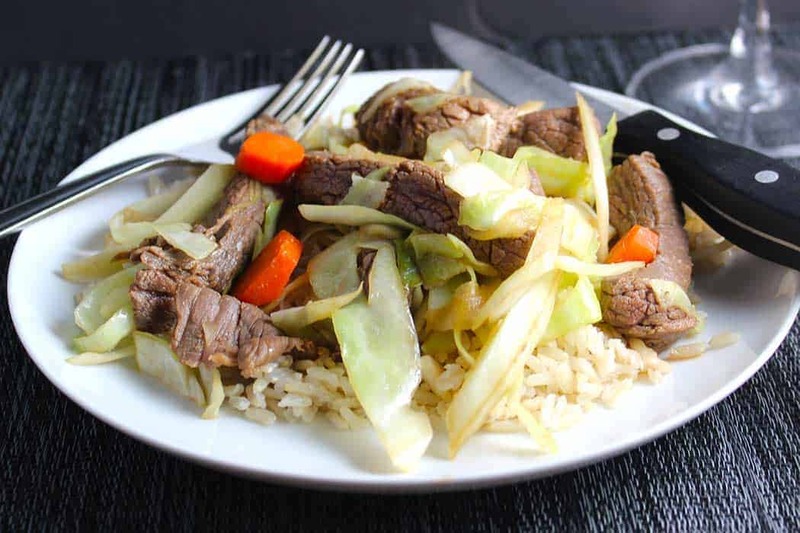 We originally came up with this Stir Fried Steak and Cabbage recipe in 2012, and enjoyed the recipe paired with a good red wine. We made the dish again and took some new photographs in 2016. For the updated version of the steak and cabbage recipe, please visit the new post. Necessity is the mother of invention. The phrase is a bit shopworn but it certainly is fitting for our latest kitchen creation. I’d planned to make one of our go-to recipes, Skillet Pork and Cabbage, with the pork chops I thought we had in the freezer. Guess you might know where this is headed…right, no pork other than bacon in the freezer! But we did have some steak, so I thought I’d essentially mashup two recipes, the veggies from the pork and cabbage along with the steak marinade, tweaked a bit, from Bee Bim Bop. 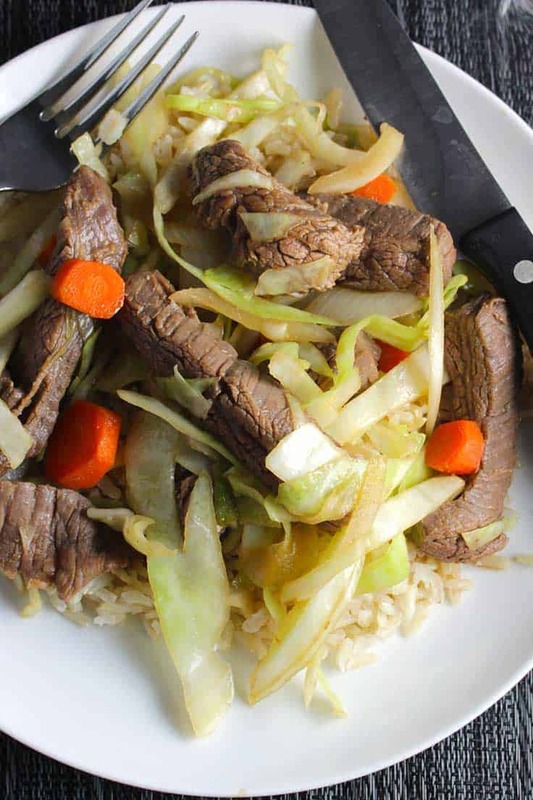 The result was an easy and tasty new dish–Stir Fried Steak and Cabbage! Combine all the marinade ingredients together in a large bowl. Add the steak, and toss to thoroughly coat the meat. Put in fridge to marinade as you make the other ingredients, or for up to an hour or so. This is a quicker marinade, I suspect a long marinade would make the meat too salty. Heat 1 tbsp oil on high in a wok or large skillet. Add the onion, stir fry for a couple of minutes. Add the cabbage and carrots, stir fry for 3 or 4 minutes until the cabbage just begins to soften. Remove the veggies from the pan and set-aside in a large bowl. Return the wok to the stove on high heat with a tbsp of oil. Add the steak, and stir fry for a few minutes until the outside of the steak has gotten brown. When the steak has been browned, stir the veggies back into the pan, combining with the steak. Stir fry them all together for another minute or two. Then lower the heat to medium, cover the pan and simmer for 3 to 5 minutes. This isn’t classic stir fry method, but I like the way it gets the flavors to meld and finishes cooking the steak. Cut into a couple pieces of the steak to check for doneness. You want this lean cut to be medium rare, or medium at most. When done, serve over brown rice and enjoy! Wine pairing: A fruit forward Zinfandel is the perfect choice for the sweetness in the dish. This was a good excuse to dip into the gifts of Christmas wine we’d received. 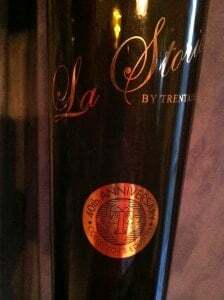 We had the 2009 La Storia Zinfandel from Trentadue, hailing from Sonoma’s Alexander Valley. The wine had nice fruitiness but enough heft as well to stand up to the steak. A happy pairing! Pair the Stir Fried Steak and Cabbage with the Zinfandel of your choice if you can’t find the La Storia. Thanks for stopping by, Rodney. Looks like you make some good stir fry too!